I am a terrible hoarder of unwatched DVD boxsets. It’s a modern blight of our affluence. So this year I’ve been doing my best to reduce the clutter on my DVD shelves and that has led me to this six disc collection in an orange slipcase. Watching the five Apes movies in order for the first time I’m struck by how good the continuity is, especially considering that most of the films were not planned with sequels in mind. Little details like reusing the design of the spacecraft throughout the films mean a lot because I like my film series to fit together into one world. The opening half hour is already visually striking, even before the apes appear. The spaceship crash is ingeniously created and because it is shot from the ship’s POV it hasn’t dated. Once the astronauts are on the surface there’s an emphasis on their tiny figures in a large unforgiving landscape. Taylor is a well-conceived protagonist who’s a bit more interesting than the average straight-arrow hero. He’s confrontational, cynical and self-reliant, but also intelligent, capable, passionate and ultimately concerned for the individuals around him, even if he doesn’t entirely respect them. I also approve of the way he doesn’t go “on a journey” to become a cuddlier, more sensitive man. He survives and achieves a kind of victory by the end. Watching the film again, I’m impressed with how balanced its components are. It’s a satisfying action adventure, a witty satire on Western society, in particular race, class and religion, and it’s a meaty science fiction concept too. Seeing ape versions of environments like zoos and museums is unsettling. A definite droll highlight is the funeral service Taylor interrupts, with the priest eulogising that the deceased “never met an ape he didn’t like”, unconsciously quoting cowboy star Will Rogers. There’s a couple of terrific horror moments too, the gorillas posing for a photo over a pile of dead humans, and the later discovery of a stuffed Dodge in the museum. The impact of John Chamber’s ape prosthetics cannot be under-estimated, a great melding of nature observation and theatricality. The apes are realistic enough to be convincing, whilst having faces that convey recognisable human qualities, such as the aristocratic orang-utans. Jerry Goldsmith’s marvellous and imaginative music score is another big factor, increasing the sense of Taylor’s alienation and the peril of the fight scenes. Noticeably absent from this first film is the theme of gorilla militarism that becomes a much bigger motivation in the series later. Here the gorillas are simply straightforward blue collar workers. Zira’s changing relationship with “Bright Eyes” as she names Taylor is cleverly written and played. Whilst always sympathetic, at first she treats him very much as an amusing pet. Later she has a moment when she’s resisting the idea of him being an equal, before accepting him as a person and in their last scene actually kissing him (clearly shown as a sign of affection rather than attraction take note). Although its ending is a well-known part of pop culture, and in fact spoiled by the DVD box art, seeing it in context the moment is still chilling. I think it’s partly because of the lack of music, just the sound of the indifferent waves upon the beach, partly the way Charlton Heston sells it, and perhaps partly in the emotion of the glass painting itself, thanks to artist Emil Kosa. It’s slightly irrational but with its mutants with psychic powers, an underground city, a more obvious antagonist in General Ursus and a new emphasis on action and militarism, this first sequel feels much more of a conventional science fiction movie than the original. To me is one of the main reasons why this sequel is inferior to the original. Another problem is that there is an inbuilt feel of repetition in the first half of the movie, as Brent undergoes the same series of discoveries that Taylor did, not to mention the fact that with the addition of a beard, James Franciscus has been cast as a knock-off Charlton Heston. That’s a shame really because Franciscus is fine in the lead and handles the action convincingly, but because of his cloned look, the film is continually reminding you that he isn’t Chuck. There are some impressive scenes. The mass unmasking of the mutants is a great set piece. The gorilla army on the march and the mass hallucination they are attacked by is an unexpectedly vivid moment, especially the statue of the Lawgiver weeping blood. Ruined New York is not as poignant as the statue because the melted buildings give the whole place more of a fantastical atmosphere and thus less recognisable. The film’s story may be darker but it also feels shallower. The first film touches on all kinds of modern concerns whilst this one is a cruder anti-war, anti-bomb parable. It also mostly misses the humour of its predecessor, aside from Cornelius and Zira pretending that he struck her, in order to deceive Zaius. It’s quite brave move to seemingly finish the series so definitely but in the coming years that knowledge of the destruction of Earth does lend an extra frisson to the further sequels. That last line from some unknown omnipotent narrator is portentous yet I find it quite effective, a moment of very literary SF. In retrospect it is such an obvious idea, reverse the journey of Taylor and make some intelligent apes the misunderstood strangers in an alien civilisation. That it works so well and makes this third sequel almost as much fun as the original owes a lot to Roddy McDowell and Kim Hunter and their strong performances. It also benefits from the return of much of the droll humour of the first film, making the fantasy seem much more believable. The sequence where they explore Seventies USA as celebrities is one of my favourite parts of the film and its loveliness only enhances the tragedy of the third act. The scene where they face a congressional enquiry and win the audience over with their wit is another highlight. It’s a smart piece of continuity that the villainous scientist pursuing the couple is Dr Hasslein, the scientist Taylor was narrating to in the first film. The story is an excellent tragedy. We know from the beginning about Zira’s past as a human zoologist and that sooner or later that is going to catch up with them. Carrying on the mirroring of the first film, their very existence challenges the society they have landed in, and it is almost inevitable they will be imprisoned and killed. The film’s sympathies are almost completely with the chimpanzee couple, although commendably human society is depicted not so much as actively evil, more misguided and short-sighted. Only Hasslein is unquestionably the bad guy for his hubris in trying to change future history. Natalie Trundy gets the best of her four roles in the Apes series, as sympathetic zoologist Dr Branton, even though she basically in the role of supportive girlfriend of the human hero Dr Dixon. I remember the final scene of the young Caesar beginning to talk being quite haunting. Watching it this time, not so much because the looping of the film to make the chimp appear to talk is more obvious to me this time. Nevertheless it is an effective end and the only film in the series to end on a cliffhanger they had already planned to resolve. Despite the fact that it often looks more like a made for television movie, thanks to an even lower budget, this is an entertaining if downbeat seventies SF parable. The metaphor about black slavery may be anything but subtle, especially compared to the first film, but it does create some striking scenes in Ape Control as human guards herd crowds of frightened apes about, moving them with cattle prods and whips. Making MacDonald, the apes’ chief supporter amongst the government a black man is also rather obvious, even if Hari Rhodes plays him well. Roddy McDowell impresses once again by making Caesar noticeably different to Cornelius. Much more aggressive and less humorous. Once a slave he quickly takes on the mantle of the alpha male in a prison block, with a wide streak of cynicism. As a result the studio re-edit of the final scene to make him a peacemaker, rather than a revenger, doesn’t really work. Those final words about treating the conquered humans with justice and fairness ring hollow, especially against a city on fire. Using the Irvine Campus of California University was a good decision, since the place certainly looks futuristic without the need for too much set dressing. Dressing nearly all the apes in jumpsuits however does lend an air of cheapness to the enterprise and it was no surprise to read that a lot of the futuristic props and sets were recycled from Irwin Allen television productions. It seemed in keeping with the TV feel of much of the film. But the story is brisk and benefits from no gratuitous romantic sub-plot being shoehorned in. If the series had ended here it would have been a satisfying conclusion. The final film in the original series is not great but it’s not a turkey either, thanks to the care taken to keep the continuity links with the previous films, and the performances, especially Roddy McDowell and more interestingly singer/actor Paul Williams as the optimistic, curiosity-driven orang-utan Virgil. It’s a more hopeful conclusion to the saga, although there remains a shadow that the promised human and ape equality will fail and humanity will devolve into mute hunter gatherers again. As with the previous film there is something of television movie feel about it all, with lots of recycled props and masks from older films. Aside from the debate about whether the future can be changed or not, after Caesar hears the voice of his father describing it, the plot in this one is shallowest yet. It is essentially a western, with the good ranchers facing gorilla black hats and mutant enforcers from the railroad company. It’s not about themes of racism and nuclear war anymore, it is about captures, escapes and a chimpanzee having to do what a chimpanzee must do. A misfire on several levels, director Tim Burton’s “reimagining” suffers from not really being about anything more than a nostalgic desire to do an Apes movie with modern technology. The film’s highlight is undoubtedly Taylor’s arrival in Ape City, watching in amazement along with Mark Wahlberg at a culture that is simultaneously non-human but with echoes of our own. The detail in the costumes and implements, drawing on Asian and African influences is beguiling. I feel this is where Burton’s real interest lies, just realising a simian-centric culture. However neither he nor writers William Broyles Jr, Lawrence Konner and Mark Rosenthal have an idea what story to set in that world. So we get a script that tries to be different for difference’s sake, making the planet definitively alien for example and bringing in genetic engineering, neither of which really adds to the interest. As for the ending, it just doesn’t make any sense tagged on to the end of the story we’ve just watched, let alone having a huge statue of Thade on Earth without any more justification than it’s a surprise. Performance wise it’s largely a disappointment too. In the role of Taylor, Wahlberg is his usual dull frowning self, whilst Helena Bonham-Carter gives one of her worst performances as Ari, failing to convey any sense of being a non-human and perfunctorily running through her admittedly trite dialogue. In fact only Tim Roth really comes out with any credit, putting in the energy and conveying Thade’s personality with his whole body and movement. Rather than telling a good adventure tale whilst holding a mirror up to our current culture, this remake is just a succession of sub-plots about characters we don’t really care about, leading to an underwhelming time travel revelation. And it’s a tribute to John Chamber’s original make-up that the ape prosthetics of thirty plus years later do not look significantly better. I’m going to leave the recent two CGI movies for another time, especially since I haven’t seen Dawn yet. Watching these movies again has been an entertaining experience. 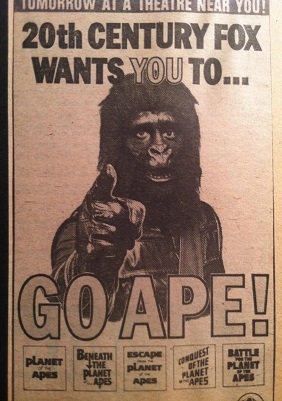 Strange to think the Apes movies were the biggest SF movie franchise until Star Wars came along four years later. They were very much films of the restless Seventies, when pre-Star Wars, USA cinematic SF tended to be gloomy and message driven rather than just escapism. The best of the Planet of the Apes series combined that intelligence with good characters and a sense of adventure and Saturday matinee peril.